Extra 6% Off on Orders Above Rs.10,000. 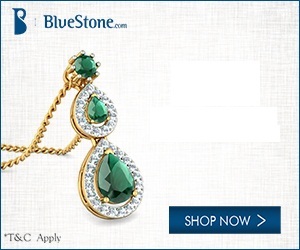 Get an Extra 6% Off on Orders Above Rs.10,000 from Bluestone.com. With coupon code: VCSF2016 at checkout. So Shop Now. Valid only on diamond jewellery not valid on plain gold or gold coins. BlueStone is India's No.1 online jewellery destination that showcases high quality fine jewellery with strikingly exquisite designs. We aim at revolutionizing real jewellery and lifestyle scenario in India with a firm focus on craftsmanship, quality and user experience. In a short span of time BlueStone has built a large family of loyal consumers in India and abroad. We house more than 4000 unique designs for you to choose from. All these designs are crafted to perfection with utmost care giving you the flexibility to customize the product's gold purity and colour or diamond clarity to suit your needs.